As the title suggests, the test (University of Montreal Track Test (UMT)) was invented at the University of Montreal. Leger and Boucher created this test in 1980 and it is used to measure maximal aerobic speed (MAS) in team sports players (6) - see references below. The MAS displays the lowest running speed that elicits VO2max (2), which is another measurement indicating the aerobic endurance. 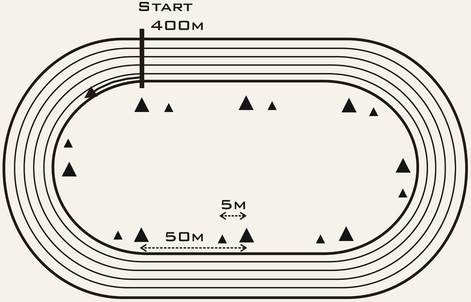 The test is performed on a 400-m track and field track. In case coaches don’t know distances on a 400-meter track, a measurement tape should be used to mark distances and cones should be used to clearly identify 5-meter zones. Obviously cones (small and BIG ones, or different colors), a sound system and an audio file of the test are needed. Pylons/cones should be placed every 50 meters (in our figure: the 50 m are marked via BIG cones) and the players need to run continuously paced by a sound signal. The starting velocity is 8 km/h and will increases every 2 minutes by 1 km/h. Due to the nature of the test, many players (an entire team) can be tested at the same times. Coaches need to split up the team and it would make sense to place 2-3 players at each 50-meter mark. Players obtain their final score when they failed to reach the 5-meter zone (in our figure: the distance from a small cone to a BIG cone) with the sound signal two successive times or when they stop of their own volition. The speed of the final level is used as the final score for the test and also the maximal aerobic speed. The University of Montreal Track test showed a high reliability (ICC score of 0.97-0.98 (5, 6)) in physical education students. Validity was investigated by comparing physiological variables obtained whilst performing the University of Montreal Track test with identical variables obtained from a treadmill (1) and the 20-meter shuttle run test/Beep test (1). There were no differences between the tests for VO2max (r = 0.96, and the correlation between the predicted vs. the measured VO2max in the University of Montreal Track test was r = 0.66 (6)) and heart rate (1, 3, 6). The VO2max obtained in The University of Montreal test was also highly correlated (r = 0.93) to another field test (2). The UMT was used in professional football players and related match performance (7). Significant correlations were found between peak speed and total distance covered (r = 0.58), high-intensity running (r = 0.65) and very high intensity running (r = 0.64) during match play. assessed by two graduated field methods in comparison to laboratory exercise testing in moderately trained subjects. Int. J. Sports. Med. 13: 243-248, 1992. Universite de Montreal Track Test to assess the velocity associated with peak oxygen uptake for adolescents. J Sports Med Phys Fitness 39: 107-112, 1999.
of two field tests to estimate maximum aerobic speed. J. Sports Sci. 12: 355-362, 1994.
for middle- and long-distance running. Part I: aerobic interval training. Sports. Med. 31: 13-31, 2001. 5. Leger, L. and Lambert, J. A maximal 20-m shuttle run test to predict VO2max. Europ. J. Appl. Physiol. Montreal track test. Can. J. Appl. Sport. Sc. 5, 1980.
simple field tests as indicators of match-related physical performance in top-level professional soccer players. Int. J. Sports. Med. 28: 228-235, 2007.